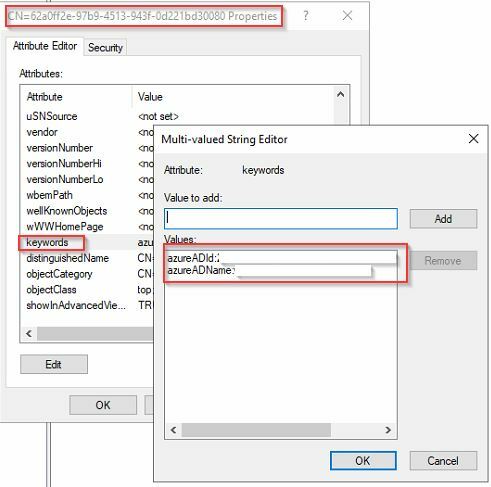 Active Directory Federation Services (ADFS) provides a secure mechanism to authenticate users, accessing applications (often in the cloud), using Active Directory credentials when Windows Integrated Authentication (WIA) is not possible. Some organisations may be starting their Office 365 journey with an established ADFS infrastructure. That’s cool. 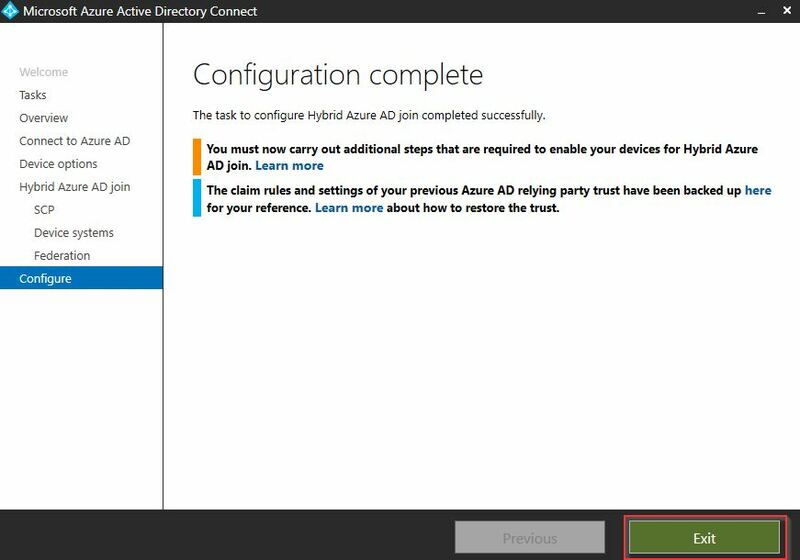 Microsoft recognizes that some of us use ADFS and fully support this option when there is a requirement to register Domain Joined devices in Azure. 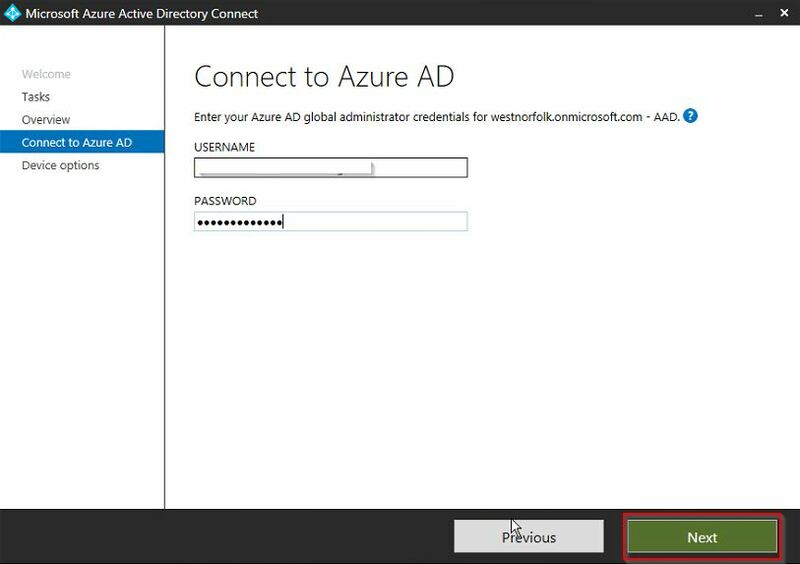 Why Enable Hybrid Azure Active Directory Join? 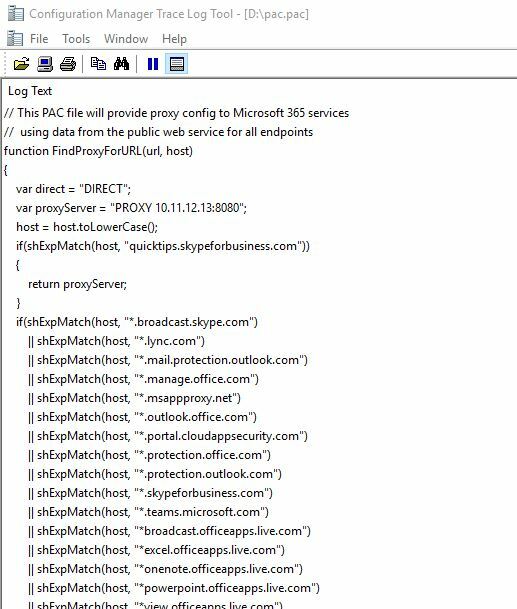 It would be a tall order to expect my users to use MFA every time they access an Office 365 service from their work computer so I might want to relax some of my Conditional Access policies if the connection is coming from a Domain Joined device. There is an expectation that we already have a good deal of control and security on Domain Joined devices..right? What does Hybrid Join actually do? 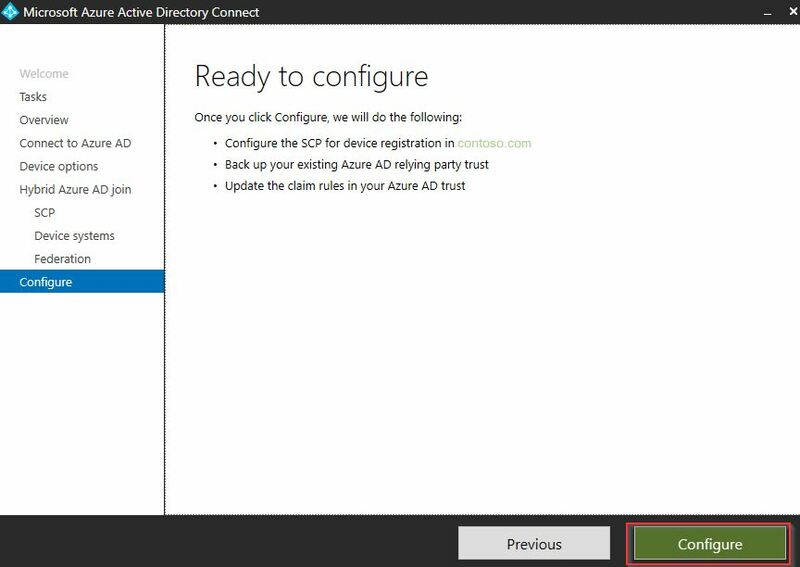 For Conditional Access to evaluate that the connection to Office 365 is coming from a Domain Joined device, we have to register these devices in Azure Active Directory – effectively allowing a trust to be formed in Azure Active Directory with the Domain Joined device. Once the Domain Joined device is “Registered” in Azure Active Directory, we can leverage Conditional Access policies. 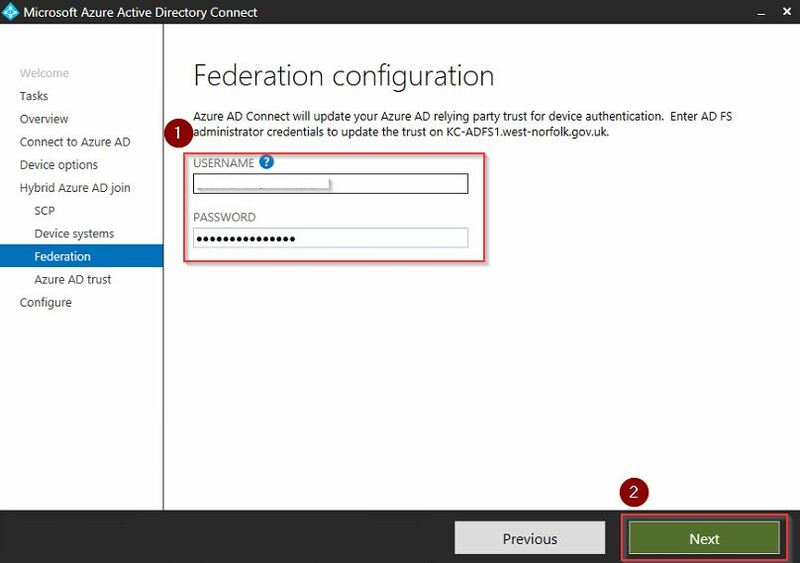 Starting with Azure AD (Active Directory) Connect 1.1.819.0 Microsoft made it really easy to instigate Azure Device Registration for those of us using ADFS. 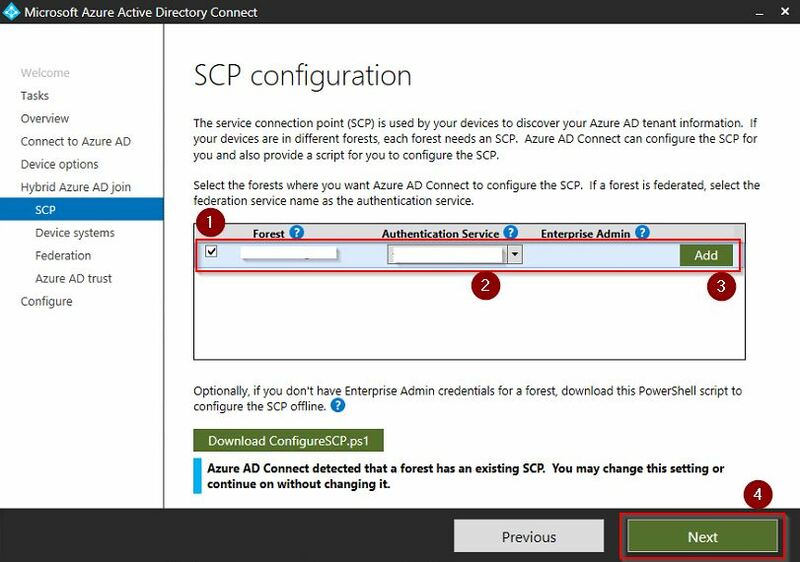 The wizard automatically updates the Service Connection Point (SCP) in our on-premises Active Directory and also creates the required ADFS Claims Rules. 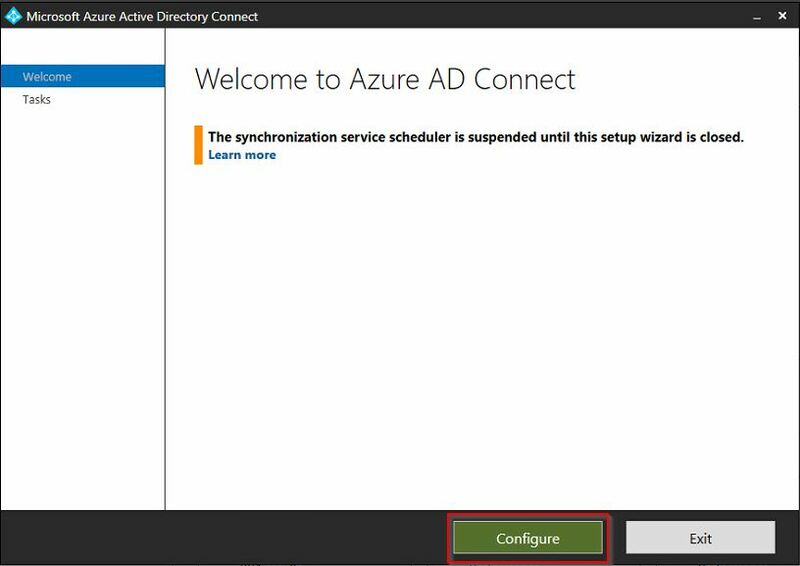 Azure AD Connect version 1.1.819.0 or higher. 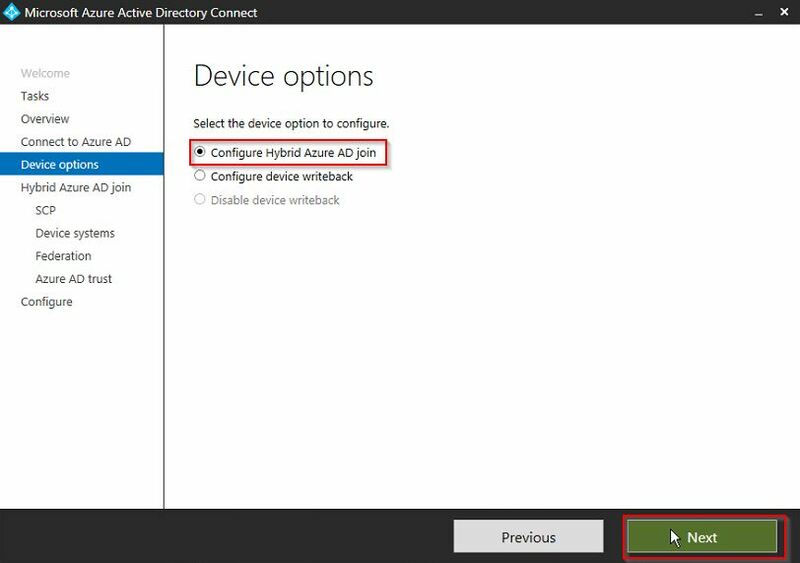 Once you have completed the AADConnect Wizard, steps shown later, ALL Domain Joined, Windows 10 clients, will automatically hybrid join Azure AD at device startup or user login. You may want to limit which devices get hybrid Joined during your POC or initial roll-out phase. You can control this behavior by using either a GPO or SCCM Client Setting. The following GPO allows you to control Device Registration: Register domain-joined computers as devices. Go to Computer Configuration – Policies – Administrative Templates – Windows Components – Device Registration. Disabled: To prevent automatic device registration. Enabled: To enable automatic device registration. *This Group Policy template has been renamed from earlier versions of the Group Policy Management console. 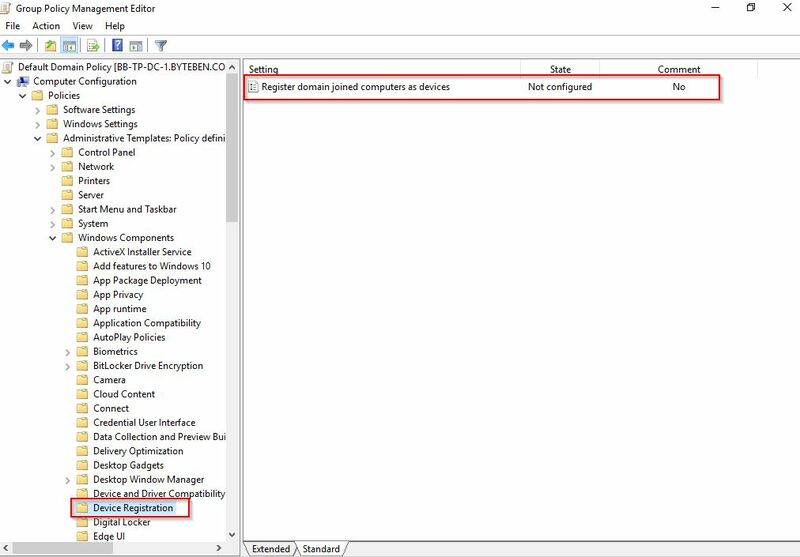 If you’re using an earlier version of the console, go to Computer Configuration > Policies > Administrative Templates > Windows Components > Device Registration > Register domain joined computer as device. Open Configuration Manager, select Administration, and then go to Client Settings. 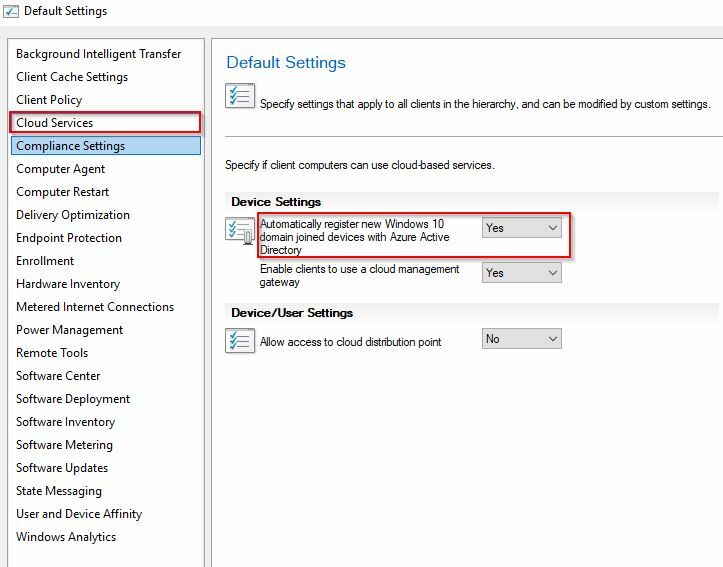 Open the properties for Default Client Settings and select Cloud Services. No: To prevent automatic device registration. Yes: To enable automatic device registration. You may also wish to consider updating your golden image to avoid an unexpected device registration in Azure AD. This can occur if there is a delay in your devices applying the a GPO or SCCM Client Setting. 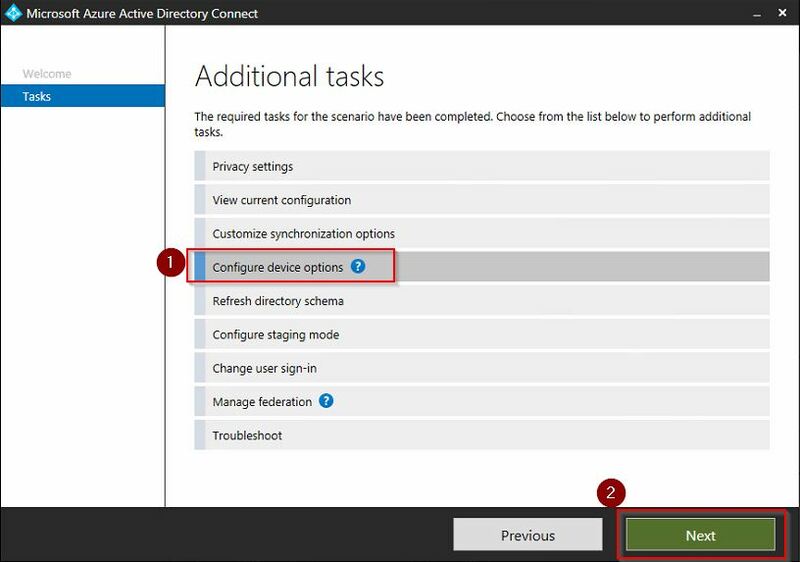 Windows 10 Device Registration occurs either at Computer Startup or User Logon. Both use the SYSTEM context to attempt a device registration in Azure. The SYSTEM has permissions to authenticate against Azure AD because it will have (hopefully) been issued an Access Token by ADFS. Most environments use an explicit Proxy or PAC file to configure USER access to the internet via the Proxy Server. Often, the device is overlooked. If you don’t already allow the Device to connect to the internet in the SYSTEM context, you will need to make some changes. What URLS do my Devices need to connect to? 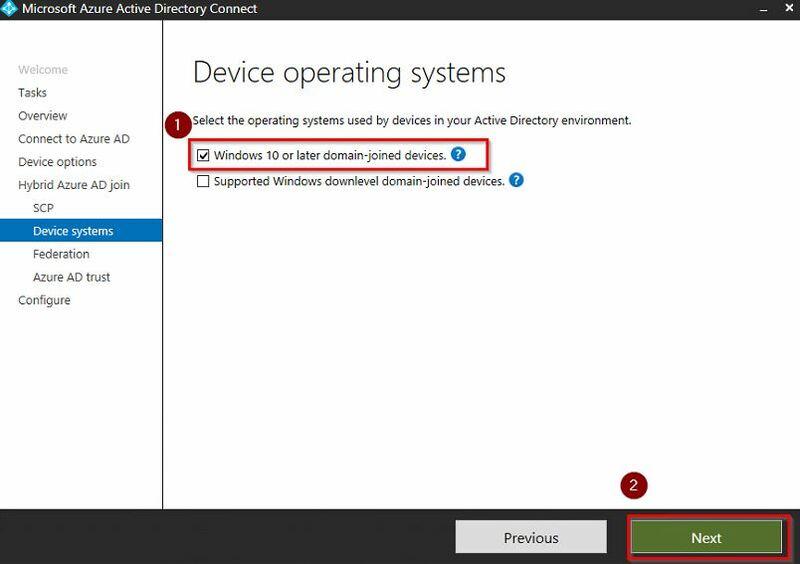 Your Domain Joined Windows 10 Devices rely on ADFS to authenticate to Azure AD in a Federated Domain. 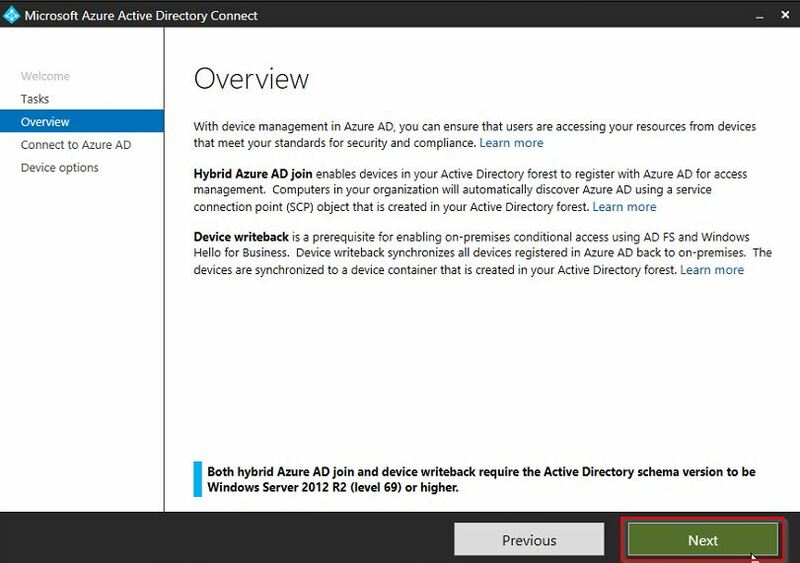 Devices will authenticate to get an access token to register against the Azure Active Directory Device Registration Service (Azure DRS). When you’re using AD FS, either adfs/services/trust/13/windowstransport or adfs/services/trust/2005/windowstransport must be enabled. 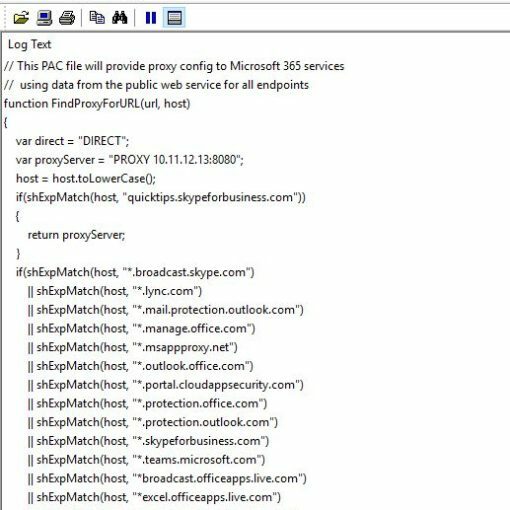 If you’re using the Web Authentication Proxy, also ensure that this endpoint is published through the proxy. 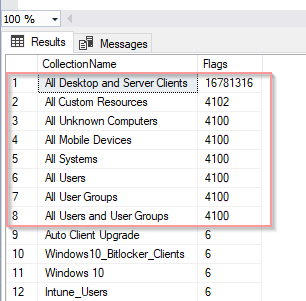 You can see what endpoints are enabled through the AD FS management console under Service > Endpoints. 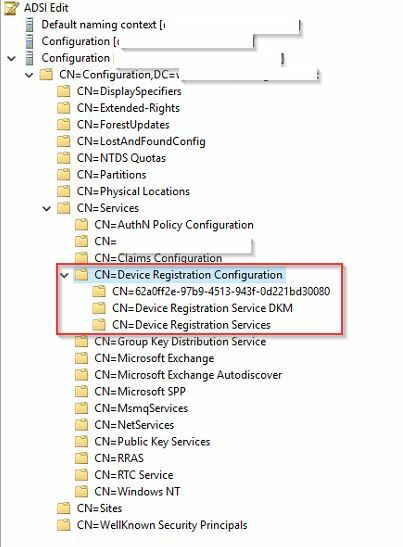 If we have used due diligence then we should start to see some successful device registrations in Azure AD. There is no “Owner” when a Windows 10 device registers in Azure AD. Windows “Down-Level” devices e.g. 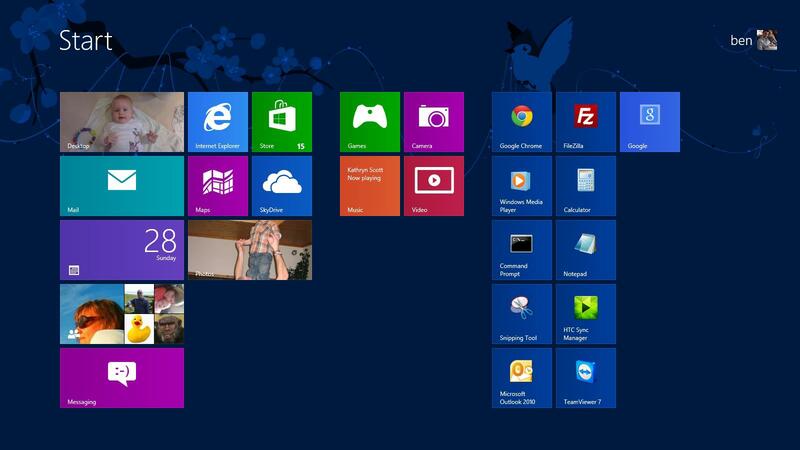 Windows 7 will register with an owner. Careful consideration should be made as each down-level device registration will contribute to the users “Device Limit” (Default 20 devices). The next step being considered by many is removing ADFS if its sole role is providing authentication to Office 365 services and replacing it with Azure AD Seamless Single Sign-On – a great feature!